We all start out with the goal of going to court in search of justice and being heard by an objective, honest judge with integrity. The fact is far too many people find out the hard way that many judges are in fact nothing close to honest and totally lack any integrity. Judges often are nothing more than bad lawyers who couldn’t hack it in the legal field and found their way to the bench. The problem is monsters like this are given immunity and power to which allows them to be “above the law”. When victims encounter them the legal authorities above do little to nothing to protect us or remove them from the bench. They are in fact also part of a bigger problem the broken justice system in America which is not about justice rather cold hard cash and greed. Think this is not true then take a look at just one website with the victims. Danny Tate is one of thousands of victims each year who are abused, robbed, terrorized and sometimes murdered by people who hide behind the “Guise of protecting us from ourselves”. Get this one fact straight “they do it for money nothing else” because when the money runs out these lawyers, judges, government and folk disappear faster than they appeared. These are the lowest form of humans on earth, vultures, leeches and whores who wear expensive suits, drive high end cars and live in upper end neighborhoods. They’re frauds who hide behind an image and the law. Probate courts aren’t generally viewed as a common locale for the fight of a lifetime, but in Fugitive from Injustice, Nashville musician Danny Tate shares a detailed account that exposes the calculated, systemic abuse that too often resides in these often quiet and seemingly unobtrusive legal venues. 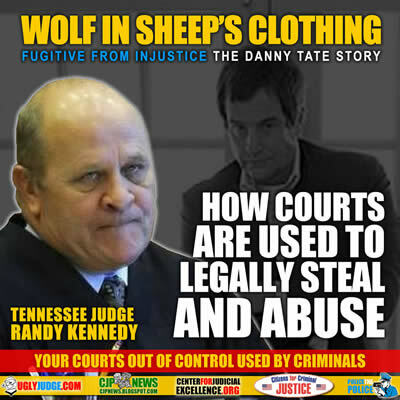 In October 2007, David Tate went before Davidson County Probate Judge Randy Kennedy claiming his brother Danny’s drug addiction had reached a life-threatening point. Danny Tate’s history of dependence also included an 18-year run of sobriety. Signing a power of attorney so his brother could pay bills while Tate was in rehab was a step intended to help return the musician to that more productive life course. Never did he dream that this power, along with his financial resources, would be used to institute a conservatorship effectively removing his civil and property rights. The public is generally disinterested or dismissive of probate abuse – at least until it happens to them. Disinterest manifests with a common position that “these things can’t happen” while the dismissive stance usually includes “you must have done something to deserve it.” Besides being patently wrong on both counts, these mindsets are also dangerously naïve. Disgruntled family members, wannabe heirs and/or unscrupulous attorneys abundantly populate our society. These parties in concert with assorted members of the legal industry (judges and other court-related personnel) can functionally weaponize the court system to the total detriment of an unsuspecting target. Nashville songwriter Danny Tate won back control of his life and finances in 2011 — or what was left of them. Now Tate is petitioning a Tennessee appeals court for the return of hundreds of thousands of dollars in attorney fees that were paid out of his bank account during the drawn-out court battle over whether Tate was legally competent to control his own finances. A quirk in Tennessee conservatorship laws meant attorneys on both sides of the case drew on Tate’s estate to pay their legal fees. Attorney Michael Hoskins, who represents Tate, said he is asking the appellate court for at least $176,000 in reimbursement for legal fees, although that figure could rise. Tate estimates his estate could be billed another $250,000 to $300,000 in outstanding legal fees. The appeals court ruling could come any time in the next six to 18 months, Hoskins said. Danny Tate’s autobiography of his life under conservatorship is available through Amazon. An autobiography focusing on the years the author has been subjected to conservatorship abuse. The reader will be shocked that this is happening in America today. Without a crime, Danny Tate was forced to live on the lam as a fugitive. This is Cane and Abel meets One Flew Over the Cuckoo’s Nest meets Girl With the Dragon Tattoo, but with a guy, and a lot of Shawshank Redemption unredeemed. Danny Tate wasn’t in court in early December to plead for the return of his constitutional rights. He couldn’t be — not unless he wanted to be handcuffed and thrown into a lockdown psychiatric ward at Vanderbilt University Medical Center a third time, or shipped to some out-of-state in-patient rehab. That’s what he thought his estranged brother, David, seemed to have in mind. If that happened, Tate, a divorcee, could lose all custody of his two young daughters. So instead of appearing in court as his fate was hashed out by opposing attorneys — both of whom, in a bizarre legal quirk, were clocking hours on his dime — Tate was at the Adventure Science Center with his little girl. It had been a little more than two years since Tate’s brother had petitioned the court for a conservatorship over him. This legal arrangement — in which the court declares someone incapacitated and a ward of the court after being presented with “clear and convincing evidence” — is akin to civil death. The ward loses control of his finances, his property, even his ability to enter into legally binding contracts. The conservatorship allowed David to seize control of every aspect of his brother’s life, from the royalty money he earns from album cuts, to the equipment at the studio where he composes talk show jingles, down to his cell phone, his car and his email account. Legally, Tate became a ghost. The problem is police “REFUSE” to do anything and when they’re aware a court is involved its certain nothing will be done. Police are in fact in bed with the courts not matter how you look at it and this problematic relationship is the crux of the problem in America today when it comes to the justice system. Police and the courts know this thus they get away with crime and murder, they’re in fact “Above the law”. This is why police can outright murder people on video and get away with it. Why judges and lawyers are allowed to manipulate the system to avoid prosecution for those with money or position.